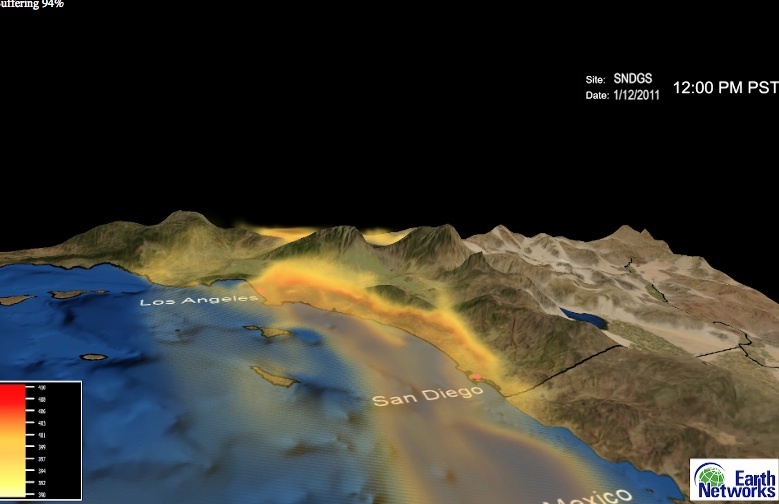 Updated: The state of California and a group of researchers from Berkeley Labs, UC San Diego, and Scripps Institution for Oceanography, plan to work with Earth Networks on a greenhouse gas monitoring network in the state. Earth Networks was formerly called AWS Convergence Technologies and is the company behind the WeatherBug app, but the firm refocused earlier this year to start working on building a network of greenhouse gas emissions monitoring stations throughout the U.S. Such a state greenhouse gas network would collect massive amounts of real-time emissions data about atmospheric carbon dioxide and methane emissions (greenhouse gases that are contributing to climate change) from locations throughout California. The data would enable researchers to monitor specific areas that are contributing a high amount of emissions, and watch those areas over time for growth or improvement. Earth Network’s stations will use gas-detecting sensor boxes from Picarro, a startup in Santa Clara Sunnyvale, Calif. The boxes cost about $50,000, are about the size of a desktop PC, and work by firing laser beams into the air to determine concentrations of greenhouse gases, then measuring the changes in wavelength signals. While the technology has existed in labs for decades, Picarro has stuffed all this measuring capability into a portable, 58-pound box of sensors that requires little maintenance. The stations will be linked via data connections, and the data will be compiled centrally so researchers can use tools to analyze the data and draw trends and info from it. Earth Networks plans to use $25 million to build out its first 100 greenhouse gas monitoring stations throughout the U.S. These types of greenhouse gas monitoring stations aren’t new; the first was deployed by Scripps at the Mauna Loa volcano in Hawaii in 1958. (Check out this excellent article in the New York Times (s nyt) last month on the Mauna Loa tracking station). But thanks to cheap data connections, and the lowering costs of the sensor technology, more and more stations can be built and networked together. Most greenhouse gas emissions management comes from bottom-up reporting, in which a company reports its energy use and other resource consumption metrics and maps out its carbon footprint. But greenhouse gas sensor networks can provide another layer of top-down data that can confirm, supplement or contradict reporting from companies. California is one of a few states that have pledged to reduce greenhouse emissions to certain levels — in this case 1990 levels by the year 2020. The global sensor network will be an important tool for fighting climate change, but how commercially successful the operation will be, I’m not sure. No doubt if the U.S. ever passes carbon legislation, and if the U.N.’s greenhouse gas negotiations make progress in the next few years, more governments and companies will want to pay Earth Networks to access its greenhouse gas data.